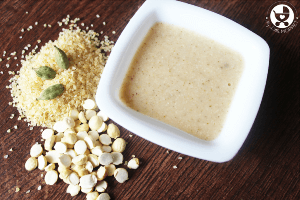 Though I have posted many instant porridge powder recipes for babies, this Instant Khichdi or the instant homemade rice cereal rice recipe was one that has been pending for a long time. 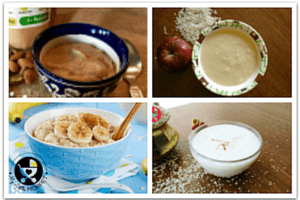 We already have a homemade brown rice baby cereal recipe, but while that one needs cooking, this is a no cook recipe. It doesn’t get easier than this! When you take cooking out of the equation, image the possibilities that this recipe opens up!! Forget about store bought cereals filled with preservatives, you have your very own instant cereal mix here! And when you’re travelling, all you need is hot water, and your baby’s meal is ready! 1. The rice and moong dal can be washed and dried in sun or used directly too. 4. Cool and grind to a powder. Sieve the coarse particles to get a fine powder. 7. Store in an airtight box in a cool and dry place. 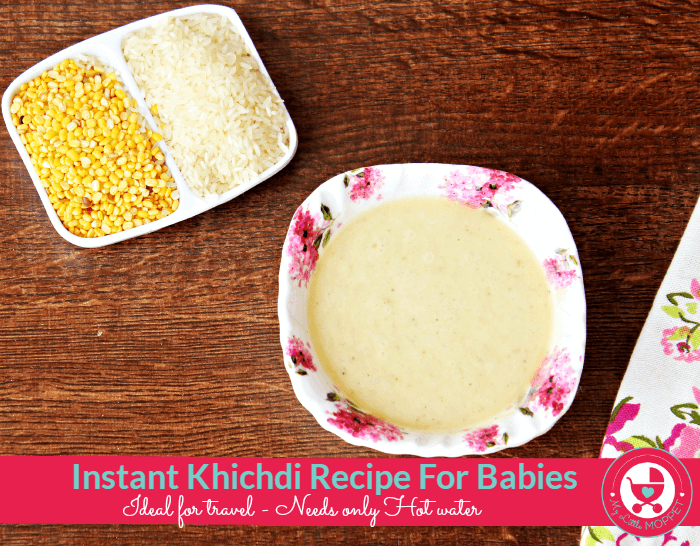 How to make Instant Khichdi for Babies? 1. Take about 4 tablespoons of mix. You can increase the quantity if you like. 2. Add 100 ml of boiled hot water to get a thick consistency and close the bowl with a lid for 5 minutes. 3. Stir through the mixture after 5 minutes and add some ghee for taste. There, now you have no reason to buy a store bought cereal mix when you can make your own healthier version at home!! And we guarantee, your baby will prefer the taste of home cooked food seasoned with your love! 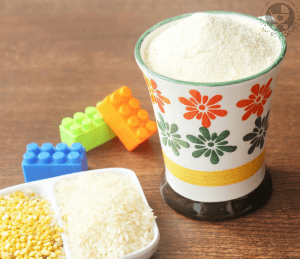 Why go for store bought instant cereals riddled with chemicals and preservatives, when you can make your own homemade rice cereal for your baby? The rice and moong dal can be washed and dried in sun or used directly too. Cool and grind to a powder. Sieve the coarse particles to get a fine powder. Store in an airtight box in a cool and dry place. To make the porridge, take about 4 tablespoons of mix. You can increase the quantity if you like. Add 100 ml of boiled hot water to get a thick consistency and close the bowl with a lid for 5 minutes. Stir through the mixture after 5 minutes and add some ghee for taste. Can this be given for babies above 6 months? 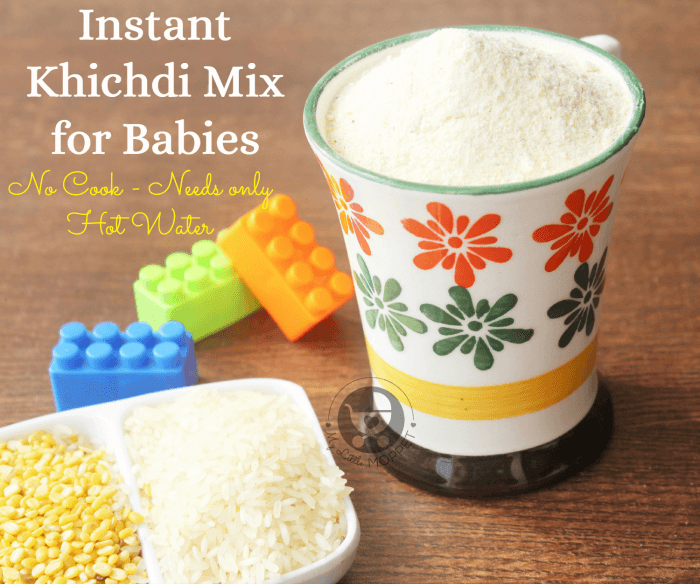 Yes dear, This instant khichdi mix can be given for babies above 6 months of age. After introducing basic foods like rice and dhal. Can we dry the washed rice dal under fan then roast it?if so,how long to dry? Sun drying is optional. You can use the rice directly. Or you can wash and fan dry until it becomes moisture free. Please don’t grind foods for them, It’s time to help them in developing the feeding abilities. Give them more and more finger foods. Let them explore foods by their own hands. Get ready for cleaning the mess 🙂 that’s okay. please don’t mind the messiness. 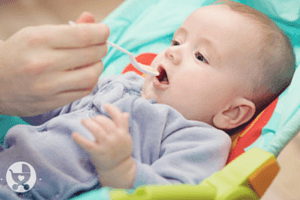 Give little amounts of semi solid foods to eat and let them practice, gradually the consistency can be changed. It’s just a phase dear. Can we use toor dal instead of moong dal ? Yes Janki, You can use. try in small batches to check the taste and then you can proceed. Yes Samreen. You can add basmathi rice. Salt and sugar can be added in baby’s diet after 1 year, If baby has crossed 6 months, you can add dates powder to add little sweetness. You can store it in airtight container for 4 months outside and in refrigerator 6-8 months. For preparing the instant mix, you will have to keep raw rice, so that you can store and reuse later too. Otherwise if you want to give khichdi to the little one then boiled rice and dal can be combined. 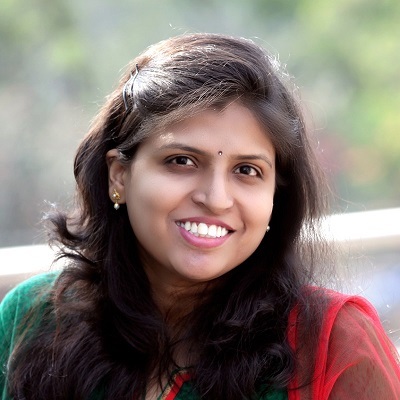 Much appreciate Nandhini your kind words. My baby is 6 Months and I started rice porridge and sooji porridge 10 days back. Can I introduce this to her before puree veggies? I’ve made rice powder and dal powder. Can I mix both in 2:1 ratio and give? Sure you can introduce new food and watch out for allergy and how the baby is able to digest. Start with small portions and usually best to give it during mid mornings. Yes you can give in that ratio. Start with about 2 spoons only. Can this be given to babies above 2years?? Yes you can do that. However as the child is now 2 years he can easily chew and eat other foods along with this too. 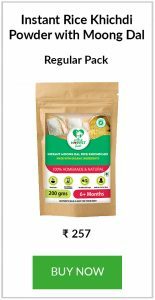 Hi mam can we add dry fruits to this powder if yes please mention what all we can add & quantity..
Dear, you can sprinkle dry fruits powder on baby food or add it to baby’s milk as the baby is around 8 months and has been introduced with all nuts separately to ensure there is no allergy. You can either buy our dry fruits powder or prepare one at home by checking the article on the site.  I have seen this blog today and there are lot of infos for moms. And now I had a difficult situation. I am currently in Germany with my mom and daughter (1.5yrs old). But i need to send my daughter alone with my mom back to india next month since my deputation date is till dec 31st. My problem is if am nearby my daughter i can feed her all through the journey but i dont have that option. So what can i ask my mom to give her in the flight travel? Hello doctor Hema, I tried making the rice powder at home but it turned out to be very coarse and grainy instead of a smooth fine powder. So I wanted to know why is it necessary to seive the rice powder?can I keep it coarse and mash it with spoon after preparing porridge so that it’s easily digested by my baby? Please let me know. Dear both are correct to do, you can try that also. 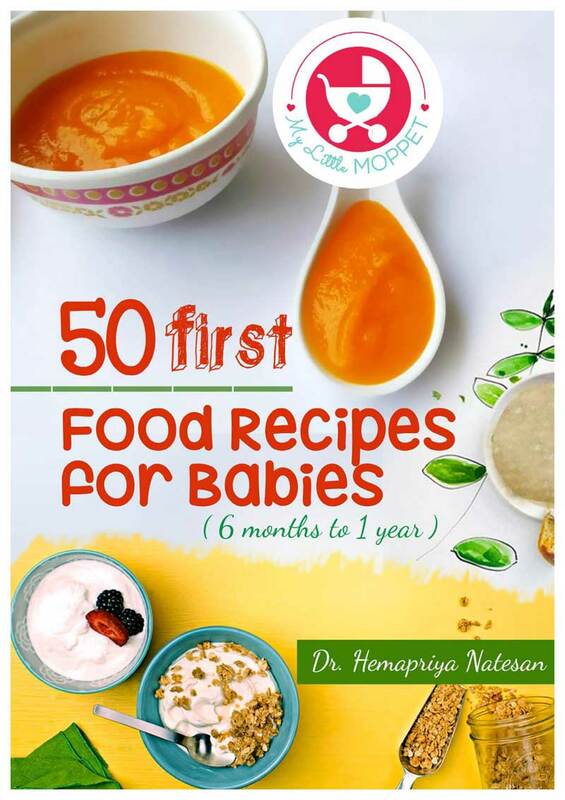 Hi mam my baby is 7mo and i havent introduced pepper till now , can i directly add for this reciepe? You can try that very minimally. Pepper usually doesn’t trouble babies. How long should i soak rice in water bfr sun drying it ?? Dear soaking is not required, wash it thoroughly and start the procedure as explained. 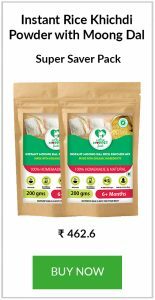 Hi our instant mixes are specially to help you give hassle free option of feedung your babies. They are roasted packed maintaining high standards of hygeine, check feeding in small portions before you travel to know if baby is able to digest easily. I do not hav kitchen scale.can you pls tell the ingredients in measuring cups? Hi dear, Rice 2 tablespoons and Moongdal 1 tablespoon. hope this helps! Thanks mam..If I wish to add turmeric powder when can I add? Hi mam..Shall I use ponni pacharisi variety or this instant version.does it get cooked with hot water? Yes you can use hot water and the rice family eats. 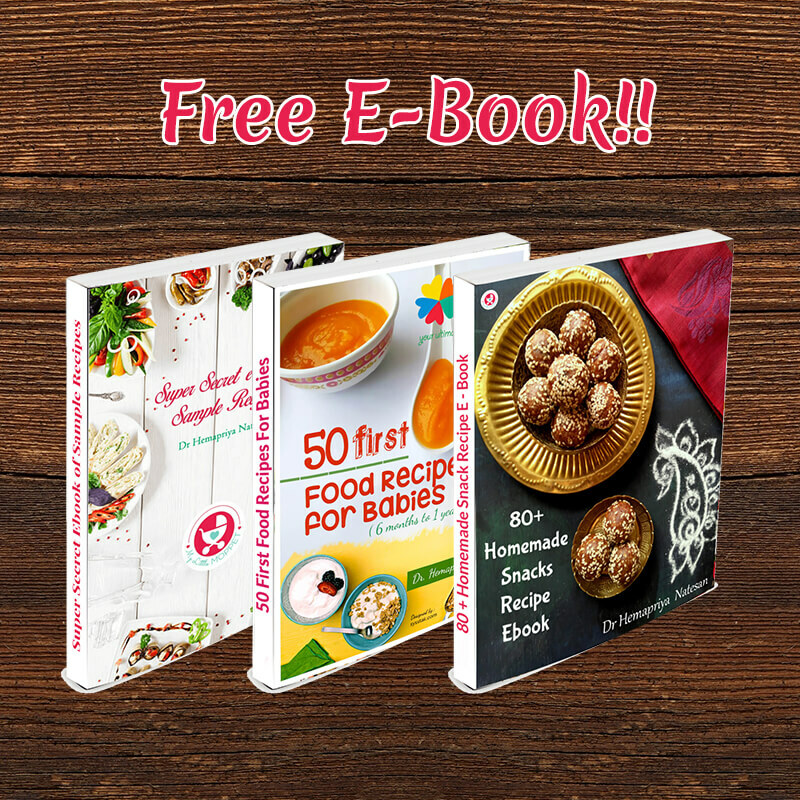 Hi mam,Thanks for all your recipes they are very useful to us. I bought Ragi porridge & sattumavu mix from ur store for my 6 month old baby. It is easily digestible. For this instant khichadi mix , I tried organic sonamasoori rice but it didn’t get puffed, plz let me know which type of rice can I use which get puffed. Hi Dr. I am thankful to you for such great guidance for ftm. My lo id 7 months now but does not eat anything which is not sweet. I have ordered sattu from your store but he eats it with great difficulty inly after adding little fm powder to it. What are the alternatives to sweeten the instant mixes? Pls suggest. Can I add Haldi and dry ginger powder while making the instant khichdi powder? Just want to know if I can use moong chilka instead of dhuli moong? My baby is 7 months old and he likes moong chilka. Also do I need to soak dal? Hi Hema… I didn’t get the puffed up consistency for rice while roasting. It got slightly burnt. Could you please tell me how to obtain the puffed up consistency? Should we wash and dry the rice and dal seperately? I tried washing it together but it came out a weird consistency after grinding. It didn’t cook well so i don’t know what went wrong. Also, if we dry roast directly, is it safe to not wash it first? Also, if we are not using it as instant, should we cook in pressure cooker for 3 wistles like brown rice cereal? can i use moong dal with skin? 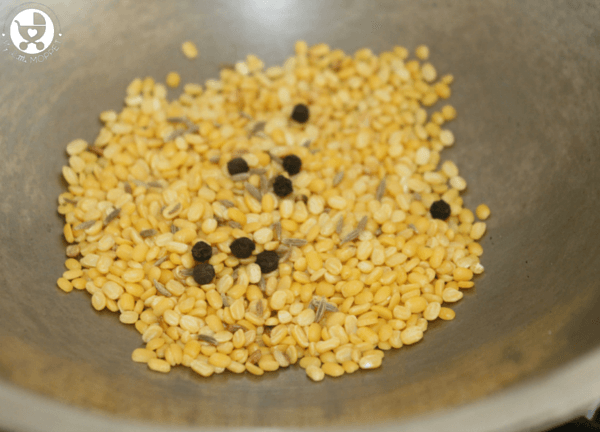 Can we use Arhar dal instead of moong dal for this khichdi mix? Hi, I havrle tried roasting rice but they didn’t puff and turned brown, same with chilka moong dal, it is OK to give it to my child? I washed and sundried them a day before. My son is also allergic to milk so can I add coconut milk to his diet? Pls if possible post some recipes using coconut milk. My son is 6 months old and I am giving him curd rice in noon and khichdi in evening with salt, what spice can I add in these both meals to replace salt!! You are doing a commendable job. Thanks so much for guiding many moms. 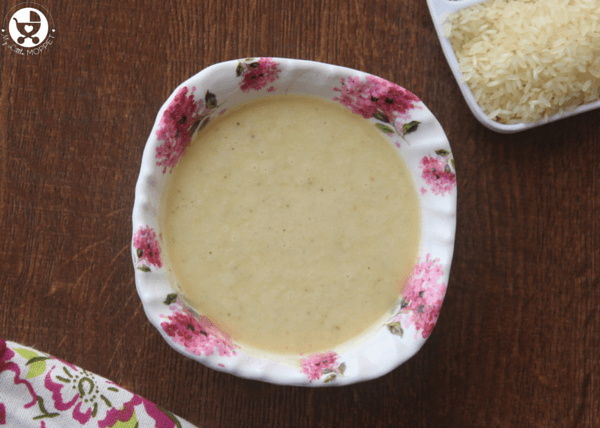 i introduced solids to my daughter at 5 months and started with ceralac. Thereafter fruits and Veges soups and dahlia sweetened with jaggery ..she’s now (7 mo) refuses to take food that is not sweet. Dals are a complete no no with her. I’ve tried giving her just dal,khichadi, changed it to green gram but it just doesn’t work. Looks like she has developed a sweet tooth. Plz help..
Hello Hema. . Thanks for the recipe.. can i give this recipe to my five month old baby? I had a doubt, should we add any sweet or salt to this one?